When it comes to buying makeup and skincare I pretty much stick with the usual FeelUnique, Beauty Bay or Debenhams websites but the other day I got an email through from Look Fantastic when they were doing a 20% and free standard delivery always a winner and I was running out of some staples so thought I'd give it a try. Lo and behold it not only had everything I wanted in stock hallelujah but it was just all rounder cheaper than on most websites I've used before with the 20% off and free delivery. Firstly I picked up my ultimate holy grail moisturiser, the First Aid Beauty Ultra Repair Cream. I have been using another moisturiser but noticed that it was breaking me out along my nose as I think it was a little bit too perfumed. What I love about this moisturiser is that it has no strong scent or perfume to it. It's really hydrating and great for anyone who has sensitive skin as well like myself. I thought this was only available on FeelUnique and Amazon but am so excited that I can also get my hands at Look Fantastic. Another holy grail product I've repurchased is the BareMinerals Complexion Rescue Tinted Hydrating Gel Cream 'Bamboo'. I've just talked about this so much on my blog recently that I really wont' harp on too much about it as I'm sure you're all close to hitting the snooze button. I have a full review on it here, but I pretty much haven't worn foundation since April and using a beauty blender I apply a very light layer to my skin. I love it because my freckles peak through and don't look weird like they do when I try and cover them up with foundation. And of course, a bonus it has SPF30 which is so important during the Summer time! Lastly a new product I picked up is the Elizabeth Arden Visible Difference Skin Balancing Exfoliating Cleanser. I've noticed that when I come back from holiday, particularly when I've sat out in the sun and then gone back home where the weather constantly fluctuates I get really weird skin bumps which make my skin texture all raised. I used this product a couple of times as my flatmate owned it and finally purchased it for myself and I can't quite believe what a difference this makes. After a week of using this just twice in the week, it goes straight back to normal. When the skin texture is all bumpy, it also dries out massively and this gentle exfoliant is perfect as it gently removes the dry skin. It also doesn't leave my skin parched after using it which a lot of exfoliators usually do - highly recommend! My overall purchases cost £44.80 instead of £56 which is a fab saving if you ask me, especially on higher end products! Let me know in the comments below if you've ever purchased online from Look Fantastic and a skincare product you've been loving recently! ohh I love the sound of that bare minerals product! The repair cream sounds absolutely lovely! I have been wanting to try the Ultra Repair Cream for such a long time, everybody seems to love it! 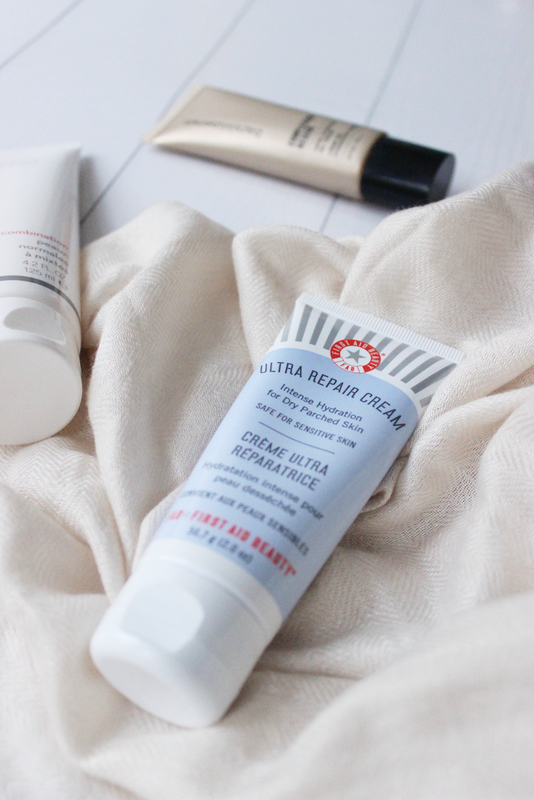 I really like the FAB Ultra Repair cream! I really need to try Complexion Rescue at long last too! Wow that Elizabeth Arden cleanser sounds awesome! I've only tried one thing from Elizabeth Arden before but I really enjoyed it, so I'd love to try more from the brand.